No matter how much you follow a system or use borrowed ideas to write in and set-up your planner, every single planner is like a fingerprint of the individual. One way to create a unique look in your planner is to carefully select the way that you write your schedule. I was looking at pictures of daily schedules that some members of the Giftie Etcetera Facebook group posted, and the difference between each daily plan was striking. 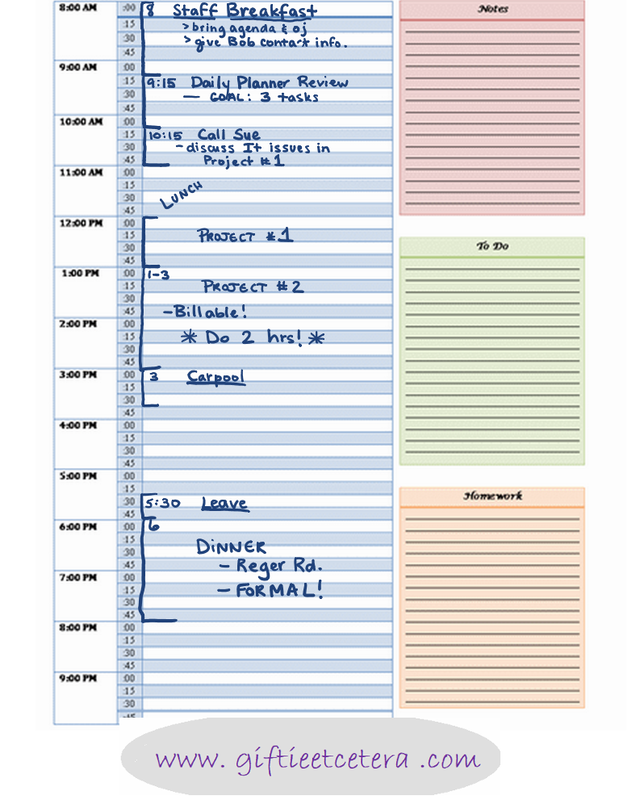 Each person used a unique system for writing their scheduled appointments. 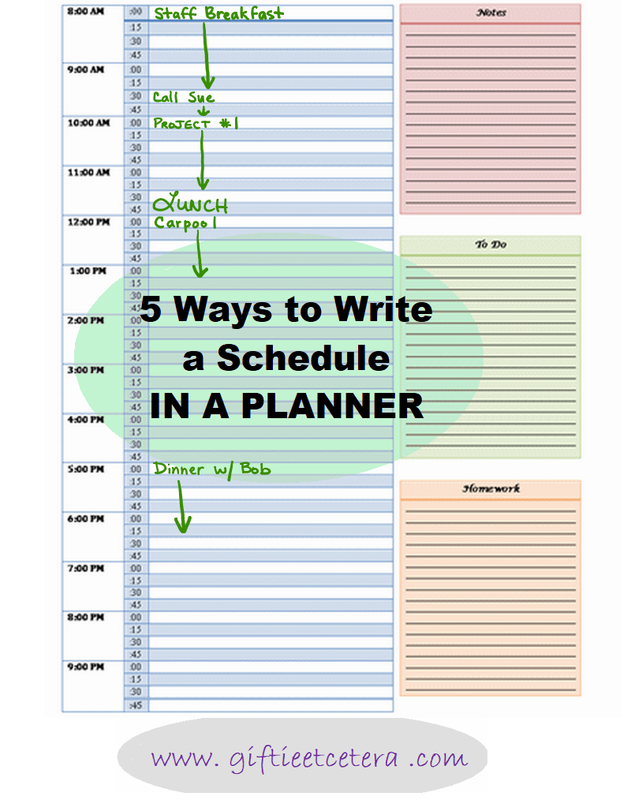 This post overviews some of the most popular schedule writing methods. Arrows create a clean daily plan, but they leave out a lot of detail. It's sometimes difficult to tell at a glance the start and end times of events. 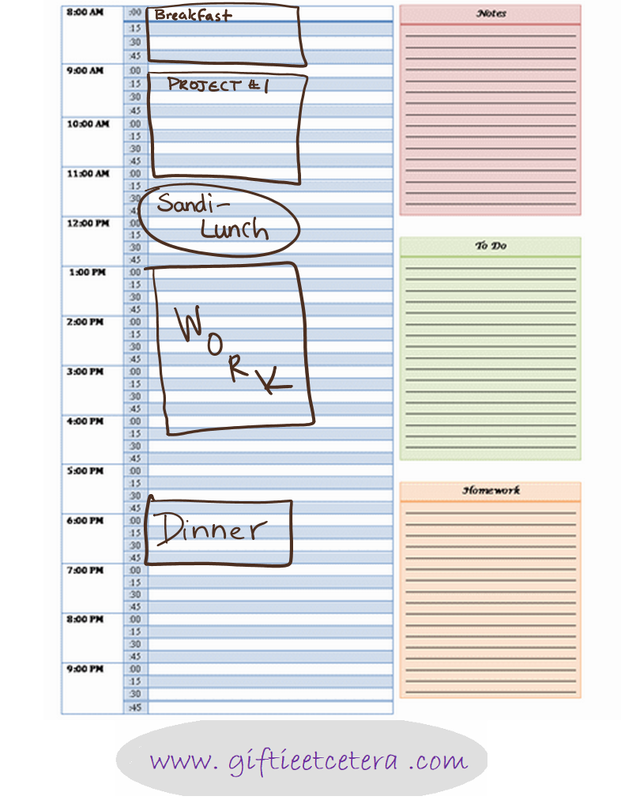 However, it does give a decent overview of the breakdown of your day. My pet peeve about arrows? They are never perfectly straight. See how the "Dinner w/ Bob" arrow is too far to the left? Drives me crazy! Boxes allow the writer to block off large chunks of time. Plus, if you are a better artist than I am, you can theoretically match up the squares on the boxes. If you need a quick view of your day, this is the way to go. However, a ton of short appointments would look rather crowded and messy with this method. Casual planning, in this case, means putting in information in a casual, writing-across-the-page way. I circled the key times in the example, to help indicate when important activities start. 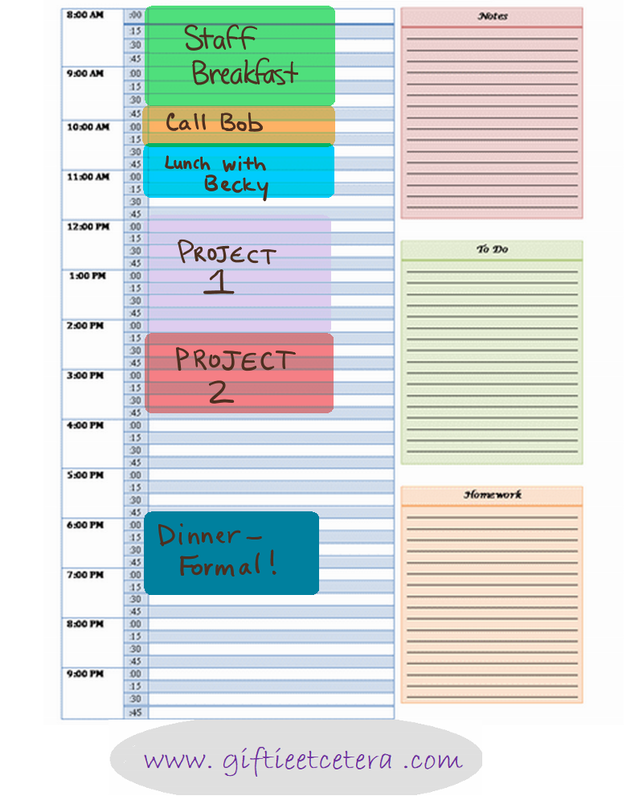 It's a quick, easy, and effective way to enter information in a planner. I like this method for a rapidly evolving day. The disadvantage? It can get messy and there is not a lot of information (like end times) on the planner page. Coloring in a box, with a computer or a highlighter, is a nice way to create a neat visual. It takes a lot of input time, though, and can be difficult to change or make perfect. This method is best reserved for schedules that need to be shared with others. This is how I plan! 1. Start times, plus any set end times, are written on the appropriate line. 2. Important events are underlined (or circled, which I don't do only because I circle repeating events). 3. Related actions are noted with an arrow. 4. Notes are indicated with a dash. 5. 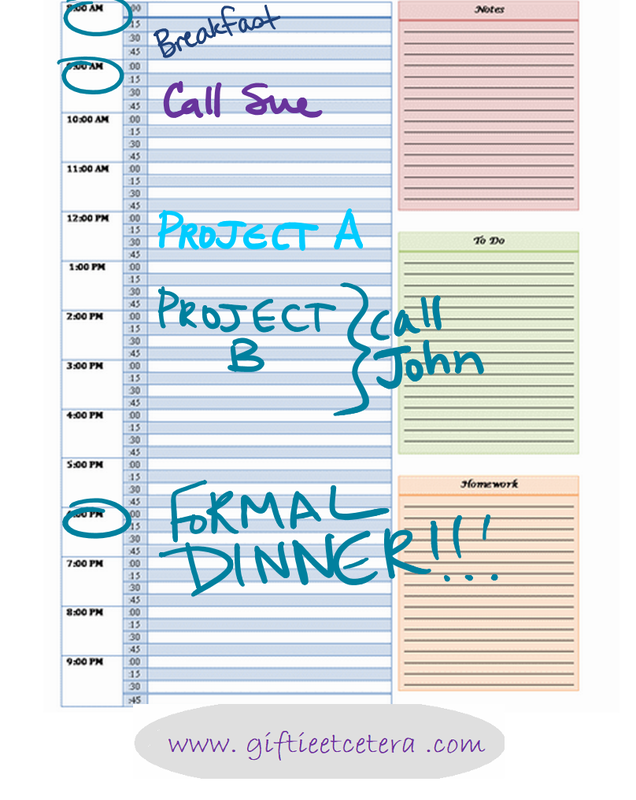 Informal times (like lunch) are jotted on the page, across the time slot. 6. A partial left-side box is drawn from before the start time to after the estimated end time. You can see how The Giftie Method is superior, right? Ha ha! It's okay if you can't. My method might not be your preferred method, and as with any planning, you should do whatever works best for you. You have unlimited options when you open your planner. Choose wisely. If you enjoyed this post, please share on social media. This post was created using OneNote on a Microsoft Surface Pro 3. Very interesting. My schedule tends to be a bit more fluid. I absolutely hate inserts w/ the times listed automatically in the margin. Makes me feel boxed in and stressed. I just write out the time with the appointment/details next to it. To me it seems as though I'm not wasting space. Thank you for your post. Food for thought! I block in times that are more than 1 1/2 hours. Anything less than that and I just write it on appropriately line and keep it moving. Trying to block in thirty minute or hour appointments tend to crowd my page. Very neat and organized. I like that because it's easy to follow. Since I don't always have daily appointments, that wouldn't work for me because I like using mine to summarize events I want to remember, and I color code. I will take a picture and upload it to the Facebook page to illustrate what I am talking about. Color coding is easier on the eyes for me when it comes to looking at a glance.My WO2P is my main pages and mine are lined and have the time slots which I draw a line through if I don't have appointments that day, or few. LOL, I use all of them. Wow you are a little bit more organized than I am . I am lucky if I can even remember to write down things in a calendar. Thank you for linking up at #HomeMattersParty hope you will come back and link up again next week. Extremely organized. I can see how this would work. Thanks for linking up and sharing with us at Funtastic Friday. Hope you join us again this week. I'm having such trouble finding a half-page size (5.5x4.25) size schedule with the hours in there! Ah! Try looking around in etsy.